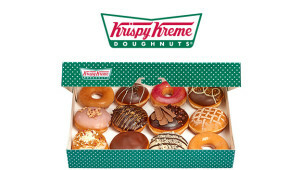 Free Click and Collect on Orders at Krispy Kreme Order by 2 pm for collection in store the following day! Krispy Kreme is an American brand of doughnut we Brits have taken to our hearts. If you have a sweet tooth, you will fall in love with Krispy Kreme from the very first bite of their delicious doughnuts. These sweet treats have been available in the UK since the start of the millennium when Harrods became the first UK store to start selling America’s favourite doughnut. Today, you can buy Krispy Kreme doughnuts from branches of major supermarkets and stores, direct from a Krispy Kreme shop, or you can order your selection of Krispy Kreme doughnuts online. There are sixteen varieties of Krispy Kreme doughnut to choose from, ranging from a classic Original Glazed through to more exotic flavours such as Tiramisu and Maple Crunch. Buy one or a whole tray, pick and choose from your favourite flavours or order 16 of the same flavour. Krispy Kreme even makes festive flavours, depending on the season, so there is plenty of scope to try something different at various times of the year. Krispy Kreme doughnuts are a tasty treat for any time of the day, but if you have something to celebrate or a huge office to feed, order Wedding & Events Doughnuts or Corporate Doughnuts. Krispy Kreme supplies individual boxed doughnuts, classic trays, and even Doughnut Towers. Talk about a fantastic way to create a lasting impression! How do I use my Krispy Kreme discount code? Click ‘Apply’ and complete your order. Become a member of the Friends of Krispy Kreme club and earn exclusive discounts and benefits. You are given a free doughnut just for joining, so there’s one great reason to sign up straight away! Krispy Kreme also sends out sweet birthday doughnut treats to their loyal members every year. Each time you visit a Krispy Kreme store, you will earn rewards. You’ll also hear about exclusive Krispy Kreme competitions and special offers first. How long do Krispy Kreme doughnuts last? All Krispy Kreme Doughnuts are made fresh on the day, so when you buy a tray of Krispy Kreme doughnuts, they are made to order. All Krispy Kreme doughnuts taste better when eaten on the day of purchase. Don’t store your doughnuts in the fridge or in a plastic bag. If you want to reheat an Original Glazed doughnut, pop it into the microwave for five seconds. Does Krispy Kreme offer a Student Discount? Yes! Students can claim a 20% discount on all Krispy Kreme purchases. All you have to do is register on the Student Beans Student Discount page and you will be sent a special discount code to use. Krispy Kreme gift cards are available from the online Krispy Kreme store. Choose from a 1 dozen Green gift card or a 12 dozen Red gift card. Other Krispy Kreme gifts for doughnut fans include a Krispy Kreme travel mug, gift mugs, a doughnut tower, chocolates and a gift tin. Krispy Kreme gifts make excellent stocking fillers and birthday gifts. Sadly, you still can't order Krispy Kremes - even the London service has been rolled back. You can, however, order for click and collect, or place larger corporate or wedding orders. You can reach Krispy Kreme via their online contact form, especially if the FAQ section doesn't cover your questions. You can check the opening times of your local Krispy Kreme by using the store finder. Every day is a doughnut day for Krispy Kreme lovers. Glazed, Chocolate Orange, Lemon Meringue - there is a doughnut to suit every taste. The only problem with a Krispy Kreme doughnut is that it’s hard to stop at just one. Luckily, we love doughnuts too, so grab yourself a Krispy Kreme voucher today and treat yourself, friends, family and colleagues for less. Because there really is no better treat than a selection of tastY Krispy Kreme doughnuts! Fundraising is a huge part of the Krispy Kreme company ethos. For decades, schools, churches, students, clubs and other organisations have ordered trays of Krispy Kreme doughnuts to sell through the Krispy Kreme Fundraising Plan. This has helped schools and clubs buy uniforms and send their kids on educational trips. It’s also helped fund scholarships for students. So, if you need to raise funds for a worthy cause, place an online order for your Original Glazed doughnuts (there is a minimum 5 dozen order). In addition to the delicious doughnuts, Krispy Kreme also sells a great range of shakes and lattes. Doughnuts are thirsty work after all, and now with a Krispy Kreme discount code from vouchercloud, you can save on your shakes too! From the Toffee Kreme Shake to the Mango Chiller, and the thirst quenching Iced Coffee, Krispy Kreme offers a great selection of drinks to pair with your doughnuts.